I’ve frequently discussed the virtues of adding some copywriting to your freelance-writing mix. But, many writers ask, how do I get started as a copywriter? Most copywriters break in by writing for a small, local business in their town. The good news: Small businesses that need marketing help are everywhere. 1) Friends and family. Tell everyone you know you’re available to write for businesses. Let them know the types of copywriting work that interest you, whether it’s brochures, white papers, direct mail sales letters, or Web content. 2) Businesses you patronize. As you go about your daily life, you interact with many small businesses. You see a chiropractor, shop at a local organic grocer, or take your kids to a gym. These are all natural places for you to connect with business owners. Your secret weapon—you already know and like the business! You could also do a barter deal for writing work since you’re already a customer. 3) Your local downtown. 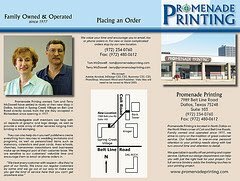 Walk the business district of your neighborhood or visit the local chamber of commerce and pick up all their current brochures or fliers. Call or stop in at the ones that have weak marketing materials, introduce yourself as a copywriter, and ask if they’d like help creating more powerful messages. 4) Your local business park. Companies in industrial parks tend to be medium-sized or bigger, and in fairly low-glamour businesses — meaning they’re prime copywriting targets. They need to get out the word, as they don’t have a shop on Main Street customers can see. Also, they tend to get hit up less, so the competition isn’t as stiff. Before you knock on doors and introduce yourself, drive through once and write down all the company names. Go home and look at their Web sites (or discover they don’t have one), so you have something to talk about when you come back and try to meet the business owners. 5) Business networking events. Wherever large groups of business owners gather in your town—the local Chamber luncheon, weekly networking group, LinkedIn meetup, or whatever—you want to be there. 6) Social media. Work your networks and online forums and let them know you’re open for copywriting work. Find prospect companies and follow them — strike up a conversation, study their Web site, maybe provide some useful marketing-article links, then make your pitch. Use your blog to discuss your quest for copywriting work. Try InMail on LinkedIn — LI reports it has an impressive 30 percent response rate. 7) In niche industries you know. This is an easy way to identify prospects, particularly if you’re looking for work blogging or writing other online content. If you have an area of expertise, look at the Web sites of all the local businesses in that niche. Then call the companies with the worst Web sites and mention the most glaring omission in their marketing plan — might they need a blog, a white paper, case studies? 8. Through content-site profiles. While I don’t recommend trying to earn by bidding on projects on content sites such as Elance or Guru.com, it can be worthwhile to leave a profile on these heavily-trafficked sites. Small businesses looking for writers do scan these sites, and may find you and approach you off the site and hire you. I recently went on an interview to ghost a CEO’s book, and the company found me through an old Guru profile I’d forgotten all about! 9) At print publications. Magazines’ article assignments are often the tip of an iceberg at a publisher. There may be opportunities to write advertorial articles for the magazine’s advertisers, or to create special advertising sections. They may put on conferences that need marketing materials, or have a “custom publishing” arm that helps companies create training courses or books that commemorate company milestones. 10) By creating a sample. If you’re really stuck for a first client, create a marketing piece about your copywriting services. You can then use this as a mailer to send to prospects. Having a sample in front of them should help you sign up that first client. Personally, when I broke into copywriting in 2005, I used a variant of #2. I called on companies I had written about in my staff-writing job at a business journal to let them know I was leaving the paper. (Many folks do this when they leave a company to freelance, by turning around and freelancing for their former employer.) One of them asked me to ghost his blog and write advertorial articles for the company’s Web site. I made several thousand dollars over a few months’ time, and I was on my way. If you’ve done copywriting, how did you first break in? Leave a comment and tell us about it. I am currently about to finally get my degree in business finance, but I was a journalism major when I first started college years and years ago. I have been in real estate and financial services for years now, but really looking for a new lease on life and never let go of the writing bug. I do have a financial blog that a started [up] again just this week and now I want to take it to another level. There seems to be so many opportunities out there, but how do you land them? Which ones are the best to go after and what are the ones to stay away from? Is it best to work for one entry-level type job at a company (kind of captive to them I would say), or is it best to stay freelance? It all seems a bit confusing and I just want to focus on the things that will be fruitful and not so much on anything out there that will be a waste of my time. There are so many opportunities out there, Barry! It’s not your imagination. And as the economy recovers, there will be even more. How do you land them? First, you find them — by networking, trolling online job boards, cold-calling, knocking on doors. Once you’ve found opportunities, you land them by auditioning for them. How can you audition for gigs? Many ways. Send writing samples. Send copywriting samples. Send your resume. Send a link to your blog. Pitch story ideas on the phone. Or build your blog audience, find advertisers for your blog and earn that way. Which are the best kind of writing gigs to go after? The kind that are really well-suited to your writing experience, life experience, and interests. When I work with my mentees, this is basically what we focus on: What have you written before? Where have you worked? What types of writing do you like best? What industries did you find fascinating? What hobbies do you love? Once you’ve answered those questions, you can seek out publications or companies that are a fit for you. Notice I said “seek out.” Yes, that’s right. You are the driver of your writing-career success. You will need to aggressively market your writing services to make a living. You can avoid being overwhelmed by all the possibilities by focusing on writing opportunities that make sense for who you are. Don’t randomly apply to every writing gig you see. Pick a couple-three niche areas and focus on them. If you don’t get results in a few months, try a few other niches that also relate to your experience and interests. But trust me, if you have a real-estate and business-finance background, you’re far more likely to find writing opportunities that have something to do with those fields than you are to find lucrative writing jobs about healthcare or horse grooming. If you love white papers, don’t apply to blog. Why? Because when you do what you enjoy, you tend to do better. And better clips mean better future gigs. Which are the types of gigs to stay away from? Writing assignments that pay slave wages — $10 a blog…you know the type. Avoid, avoid, avoid. Writing assignments you’re not interested in and eager to write. Also avoid. I wish I could give you a magical answer to how to break into writing without wasting your time, Barry. But here’s how you’re going to find out what types of writing you like, can get gigs in, and pay well enough to be worth your while: Trial and error. Sometimes, you’ll try to go in a writing direction — for me last year, that was trying to crack the business-plan writing market — and it just won’t pan out. So you’ll try something else. Lather, rinse, repeat. You can create a shortcut by focusing on what you’re best qualified and suited for, but you’re still going to have to experiment to find where you fit. As far as full-time versus freelance…right now I’d say that full-time writing jobs are in very short supply. The woods seem to be full of laid-off journalists. But by all means, if you need the security of a steady paycheck, look for a full-time gig — or maybe a job within your fields of experience that involves some writing, and could serve as a bridge into writing as a career. Personally, I had my highest-earning year ever in 2009, including the 12 years I was a staff writer for two different publications, so I may be biased toward freelancing! But as a brand-new writer, freelancing may also be a better way to go because there’s less deadline pressure and you can learn at your own pace. Are you ready to come up with three or four great story ideas, report the stories and file them, each and every week? Or crank out polished white papers in short order? That’s the typical workload of a staff writer. When I started, it took me about six weeks to write one feature story! I would have washed out as a staffer. To sum up: Look in the mirror. Who are you as a writer? What do you need financially? Answer those questions, and there’s your answer for how to become a freelance writer. Got any time-saving writing-job-hunt tips for Barry? Leave a comment below and tell us about it. If you enjoyed this post, don’t miss any of my free tips on how to earn more from your writing — subscribe! I read the most amazing article the other day, about the tragedy of parents who forget their babies in their cars, and they die of the heat — and whether that should be considered a tragic accident, or a crime. It won the 2010 Pulitzer Prize for feature writing for Washington Post journalist Gene Weingarten…and I could not put it down. Weingarten clearly invested huge amounts of time in the story, interviewing several devastated families that had lost a child, listening to 911 and police-interview tapes, talking to memory experts and lawyers. The result is haunting and unforgettable, and may change laws. Reading this story was a great reminder for me of why I got into writing — to enlighten and make a difference. To write articles that are truly memorable and meaningful. As freelance writers, everything we write can’t fall into this category. We’ve gotta earn, gotta keep that hourly rate up. Investigative work is a passion of mine. It’s important for my growth as a writer to tackle stories that are hard. Because big stories can win prizes. Stretching your skills and taking difficult writing assignments makes you a better writer. So when I see a chance to do an intriguing, big story, I take it, even if it makes no sense from an hourly-rate perspective. Recently, I tackled a research-based story on how much stimulus money my state got, and where it went. Previously, I’ve written investigative pieces on a care center for babies born drug-addicted, my state’s lax drunk-driving laws, and the plight of older foster children. Several of these feature stories have won prizes over the years. I say this not to gloat, but to make a point: Prizes can help your writing career. I recommend you get the Writer’s Market, take a look at the hundreds of contests in there, and make a plan to enter a few you think you could win. Why are prizes important? Two reasons — they’re great for your self-esteem, and they impress the heck out of prospective clients. 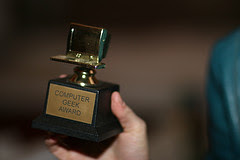 A couple of years ago, I got the idea to create a short awards page on my writer Web site. I couldn’t believe how the quality of my prospects improved after I did this! And that has made all the difference. While I hear many writers complain they never hear back when they send out resumes, I often do. I often hear back that same day. And I’m convinced the “see my awards” line is a big reason why. Prizes are powerful, and a list of prizes — no matter how minor — is even more powerful. Prizes make you feel successful. They greatly enhance your reputation. At some publications I’ve worked for full-time, they held annual planning meetings about what awards the reporters should aim for that year. I felt like a movie star last week when the contest site Awarding the Web told me my Make a Living Writing blog had made their 2010 Top 40 Freelance blogs list. Being on this list puts me in company with sites I really admire, including Freelance Folder, Poe War, Angela Booth’s Fab Freelance Writing blog, The Well-Fed Writer, and Writer Beware, among others. Added bonus: I got a fun little award widget to put on my blog. Winning prizes is a kick, no matter how small the prize. So go out there and be amazing. Write the hard stuff. Win prizes. And watch your career soar. So here’s the story of how I became a freelance writer. It happened in L.A. In the beginning — like when I was 14 — I was a singer-songwriter. Banging away on my parents’ black baby grand, scribbling lyrics in notebooks and taking them to school to throw out so my mom wouldn’t read my rejects out of my trash. I dropped out of college halfway through to hang around Hollywood Boulevard and go to songwriting workshops, where I eagerly awaited a chance to have my work shredded by my peers. Songwriting involved starving. It cost money to pay band members, to rent halls, to promote my group. I needed a day job, so I worked as a secretary at movie studios and talent agencies. There, I learned to stay calm and poised while movie stars asked me questions, or big agents barked orders. I learned to have a snappy comeback. Eventually, I started my own script-typing business, feeding off my show-biz connections, and worked for myself. Around the time I was nearing 30 — the age at which songwriters have to ask themselves whether they’re up for a lifetime of this starvation or they want to move on — the alternative paper L.A. Weekly was celebrating its 10th anniversary. So they had an essay contest. It was like they created it just for me. I had moved back to L.A. to pursue songwriting ten years earlier. So I wrote an essay about what coming to L.A. to be a songwriter was like for me and my friends — namely, like slowly being crushed between two large rock walls. They printed it and paid me $200. Writing prose was empowering. I didn’t need anyone else to do it! I could execute this all by myself. I had all the intruments I needed inside my head. I thought it up, I talked to people, found facts, worked on it, went down to the mini-mart on Thursdays, and boom, there’s my name. Wow! I was a byline junkie from day one. From there, I got another assignment from the Weekly right away. But then I took a third assignment I got in over my head on, and bombed. I then pitched their rival, the L.A. Reader (now dead) about some protest I was going to. I ended up writing for the Reader for years, reviewing books, writing cover features for $300, community news for $50. All the time learning, learning, learning. I’d haunt my editor’s office, latest issue of the paper in hand, saying, “I noticed you changed my first sentence from this to that. Why?” I got better. I wrote faster. I started to earn more from articles, and type scripts less. Soon, the Los Angeles Times had a contest in the real-estate section. They wanted do-it-yourself fix-up stories. Again, tailor-made for me — my husband and I had just spent several years camped on our living-room floor fixing up our charming hovel in Culver City. I wrote a humorous, “our hearts were young and dumb” tale of our remodeling mistakes. I’d been writing prose for about nine months, and I was writing for one of the largest daily papers in the country. I was massively intimidated, felt hugely inadequate, and as a result it often took me six weeks to write a feature for them. But my editor put up with it and took the time to mentor me, because my writing was fresh, and honed, and really brightened up their section covers. And I was willing to work hard, beat the street, and find great stories. Around this time, it started to dawn on me: I am a freelance writer. Maybe I should take this freelance writing thing seriously! I love this, and it could be a career. So I took some classes through UCLA Extension in journalism, magazine writing. I learned more. I got better gigs. One day, my husband said, “Why don’t you stop typing scripts and just write articles?” And I did. Not long after that, he was losing his job, and I applied for this weird full-time writing job I saw advertised, for a trade publication based in New York. They looked at my Reader covers, my L.A. Times covers, they gave me a writing test, and told me of 24 writers they auditioned, I was the only one who wrote something they could publish. The job paid $45,000 to start. And so began my 12 years as a staff writer, in which I learned many new skills, filed three or four stories every week, and laid the ground work for my second stint as a freelancer, which I’ll write about later this week. Looking back over this, I see some defining points to why I was able to build a successful writing career, basically from scratch. I think these traits would be helpful to anyone looking to get into freelance writing. 1. I didn’t develop a lot of writer insecurities, because it didn’t dawn on me that I was a freelance writer. I was just having fun! 2. When I hit roadblocks, I immedately looked for a workaround. It never occurred to me to stop because of one “no.” I liked being published too much! 3. I was willing to study my craft, both with my editors and by going back to school. 5. I looked for opportunities that were a great fit for my background. 6. I developed a thick skin early on and was open to criticism of my writing. 7. I had run a home-based business before, so I had some knowledge of the hustle and administrative skills required to make that work. That’s the story of how I wrote my way into a career as a writer. How did you get started? How did you keep going? What skills did you bring to it that made you successful? Leave a comment and tell us your story. Later this week, I’ll tell you how I broke into freelance writing all over again, 12 years later, in 2005.